Tanner Gun Shows are Colorado’s oldest, largest, and absolute premium gun shows. Vendors at Tanner Gun Shows draw thousands of visitors and make tens of thousands of sales at each show. If you desire a strong gun show in Colorado–Tanner Gun Show is the premier gun show for you. New vendors are encouraged to call and find out more about availability per show as some shows have a vendor waitlist. The Tanner Gun Show in Denver is the Rocky Mountain region’s premier gun show. Not only are we 3X as large as any other gun show in Colorado, but we’re obsessively committed to advertising. We advertise on TV, radio, newspapers, billboards, magazines, internet, and roadside signs. We also have an extensive email list (40,000+) of people to whom we send show reminders and coupons. Ask anyone who has set up at our show in the last couple of years. No one promotes a show like we do! We are just as committed on the operations side. We will do everything within our power to make your every visit to the Tanner Gun Show a success. When you exit I-25 at 58th Ave. go East and take your first left turn (you will see a Steak Escape/Taco John’s on your left). Just take that road about 300 yards and you will see the Pavilion building with our sign out front. The International Fire Code 2018 has added an entire section for Indoor Tradeshows and Exhibitions. One item that has been updated are covered booth (tents). Please see our Dealer Rules & Regulations before sending in your registration. If you would like to display your wares at our show, please use our “printer friendly” Registration Page to submit your registration form. Please reserve early. These shows almost always sell out well in advance. Full payment must accompany registration by mail. Please note that all registrations are subject to our approval. New in 2018 Tanner Gun Show comes to Colorado Springs! The Tanner Gun Show has now expanded to Colorado Springs! 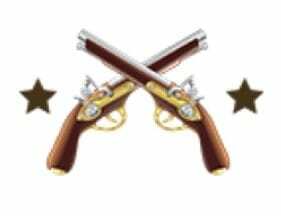 New in 2018 the Tanner Gun Show will be in Colorado Springs for two shows at the Norris Penrose Event Center. Not only are we 3X as large as any other gun show in Colorado, but we’re obsessively committed to advertising. We advertise on TV, radio, newspapers, billboards, magazines, internet, and roadside signs. We also have an extensive email list (40,000+) of people to whom we send show reminders and coupons. Ask anyone who has set up at our show in the last couple of years. No one promotes a show like we do! Please reserve early as this is a new show and we expect to sell out well in advance. Full payment must accompany registration by mail. Please note that all registrations are subject to our approval. The Tanner Gun Show in Pueblo is Southern Colorado’s premier gun show. Not only are we twice as large as any other gun show in Southern Colorado, but we’re obsessively committed to advertising. We advertise on TV, radio, newspapers, billboards, magazines, internet, and roadside signs. We also have an extensive email list of people to whom we send show reminders and coupons. Ask anyone who has set up at our show in the last couple of years. No one promotes a show like we do! For our Pueblo show we advertise heavily from Colorado Springs all the way into New Mexico. We only do 3 shows per year down there so people get excited about these shows. They are always well attended and people come ready to spend money. The Show is in the Agriculture Palace Building at the Colorado State Fairgrounds. The address for the State Fairgrounds is 1001 Beulah Ave, Pueblo, CO 81004. The Agriculture palace building is near the center of the Fairgrounds property and we always have our large pink banners hanging on the corner of the building. If you would like to display your wares at our show, you can use our “printer friendly” Registration Page to submit your registration form. Please see our Dealer Rules & Regulations before sending in your registration. Please reserve early. These shows almost always sell out. Full payment must accompany registration by mail. Please note that all registrations are subject to our approval.